Finally, here is the recipe so many of you have been asking for! 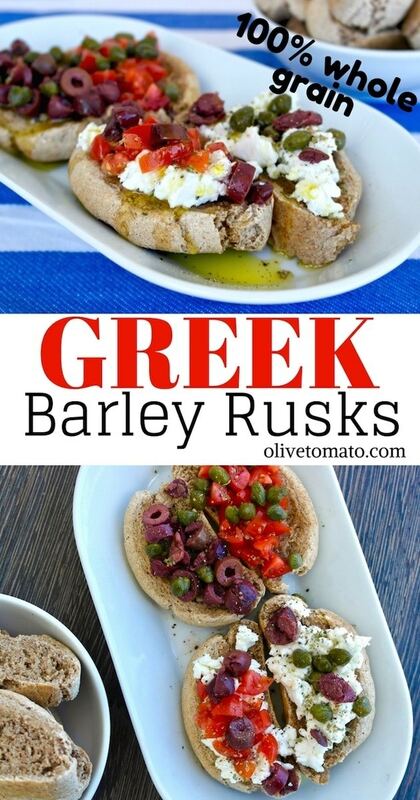 Authentic Greek Barley rusks. Not very easy to find outside of Greece, but so delicious and hearty! This Barley rusk is actually a Cretan rusk and is essentially double baked bread that is made with barley flour and sometimes a whole wheat flour. Making rusks was practiced in families that could not bake bread very often so they made these rusks. In addition rusks lasted a long time and traveled well. Barley flour was often used because it was more filling, which was necessary in those lean times. 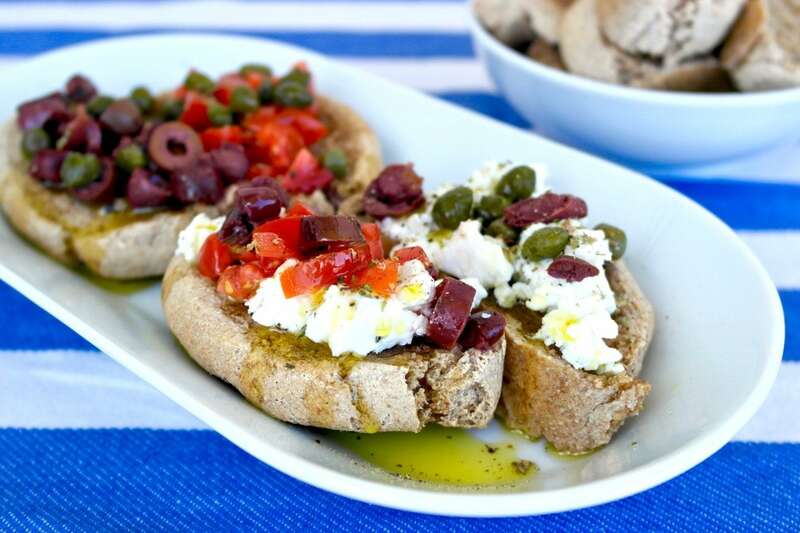 This type of rusk is present everywhere in Cretan cuisine which is known to be the prototype of the Mediterranean diet. It is either round shaped like a bagel and is called a kouloura or cut in thick slices and is called a dakos. It is slightly soaked in water and drizzled with olive oil and then consumed with cheese or tomato or olives, sometimes just olive oil and oregano. 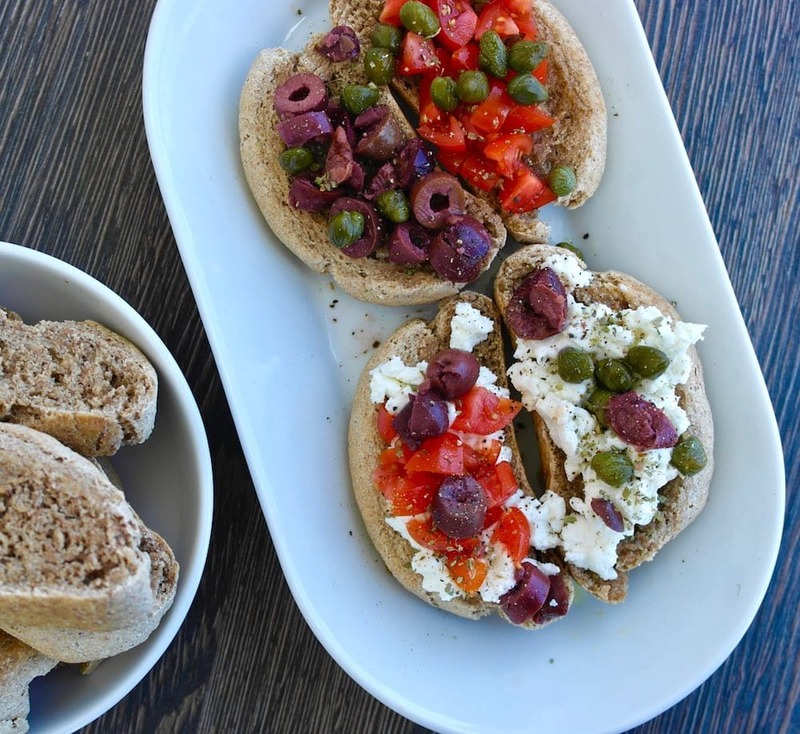 Its most famous use is the Cretan Dakos which is a barley rusk drizzled with olive oil and topped with grated tomato, fresh cheese, olives and sometimes capers. I call it a Cretan salad. These rusks are a staple in our home. 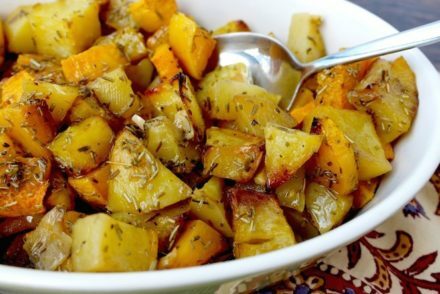 I often eat them as a snack or breakfast using any topping on hand, sometimes I break them and add them to salads and soups like croutons. Most often we use them in the place of bread for dipping in the sauces and olive oil of the various vegetable casseroles. We love the crunchy texture. 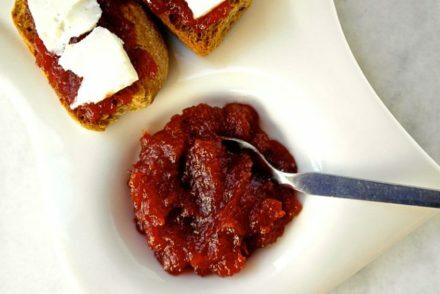 Rusks -called paximadia in Greek- are made in all parts of Greece, and what makes the Cretan rusks unique is the fact that they are made with whole grain barley flour, this makes them extremely healthy. Due to the fiber these rusks provide a feeling of satiety, barley flour also contains beta-glucan, a fiber that is known to be effective in reducing cholesterol levels as well as having prebiotic activity which helps increase good bacteria in our digestive system. These particular rusks are 100% whole grain and so they can be somewhat tough and hard, that’s why it is important to pass them under some water (just a few drops) so that they can soften a bit, but still have a crunch. There are a variety of ratios of different flours to be used, I wanted the 100% whole grain version, so I only used whole grain flours and used a 50/50 ratio (barley/wheat). You can play with ratios. Generally more barley flour will result in a darker rusk. Also, this recipe requires a bit of kneading, I used my hands (instead of a mixer) and I have to say after a while, I found the kneading to be surprisingly calming. Luckily in Greece we have plenty of traditional rusks available at bakeries and markets and if you are in Greece I recommend buying a bunch of bags to take home as they have a very long shelf life, but if you are not visiting Greece anytime soon, then here is the recipe, I very much enjoyed making them! In a large measuring cup or bowl we place the yeast (you can break it up) about a half cup lukewarm water (not hot) and a pinch of sugar and mix. Let it sit for about 10 minutes when it starts bubbling on the surface. If you are using dry yeast follow the manufacture’s directions. In a large bowl, mix the flour, 1/2 teaspoon salt and the sugar. Once the yeast mixture has bubbled, make a whole in the middle of the flour mixture and add the yeast mixture, than add 1 1/2 cup water and start kneading until you have soft (not thick dough) that does not stick to your fingers- I kneaded for about 10 minutes. If you are using a mixer, use the dough hook and mix on low speed until dough is soft and does not stick to the sides of the bowl. If dough is too dry add gradually a bit more lukewarm water. Shape into a ball and place in a greased bowl. Cover and let it sit in a warm place until it raises (about an hour). 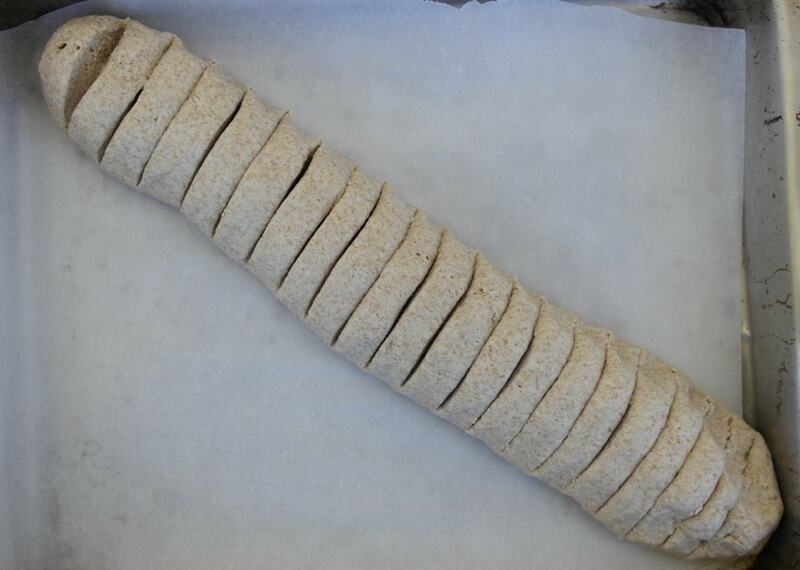 Once the dough has risen, knock back the dough and shape it in a long loaf about 1 1/2 inches (3 cm) wide. Cut (not all the way through) in slices and cover the dough and let it rise again. Now bake the loaf for about 1 hour. Remove from the oven and lower temperature of oven to 210 F (100 C). Once the dough has cooled just enough handle it, separate the slices (I used a knife to do this) and spread them on a pan. Bake for 2 hours until completely dry. Is the oven temp 180 c or f? I’m so excited! Thank you so much for posting this. Hi it is 180 C, 350 F . Just updated it! Elena you said 1 1/2 water. Is the 1/2 c you mix in the yeast part? Or is it 1/2 c for the yeast and 1 1/2 c water for the dough? Hi Terra. It would be total 2 cups. However you may need extra water as needed if the dough is too dry. How thick are the slices? Diagonal? Hi, About 1 1/2 inch wide horizontal not at a slant. I’m in love with barley rusks! First time I ate them in Crete, I thought why don’t we have these in Philadelphia? Thanks for the recipe! I love them too! Maybe some Greek market/grocery store may carry them. I’m so excited about this recipe! I have scoured every grocery store in my area for a barley rusk, and left empty handed. Thank you for this!! Thanks for posting this recipe. I’ve been wanting to make rusks for a long time but could not find a whole grain recipe. However, I’m worried about the “7 1/2 tsp. dry yeast”. Is that a typo.? That’s a LOT of dry yeast. Most recipes use less than 3 tsp. I just made a batch of these and they are delicious! I only used 1 1/2 cups of water in total. I found that with 2 cups water, my dough was more like a batter. Next time I’ll try it using just 1.5 cups, as Christine did. I kept adding more of each dry ingredient (in proportion) so that it was at least a soft sticky dough. Not sure if it will be a success. Also not sure what is meant by “whole grain.” Barley flour is hard enough to come by. I ordered mine on amazon and it merely says “Organic Barley Flour.” Could this be a reason my dough was so wet? The flour you used should be fine. The 2 cups of water includes the 1/2 cup used for the yeast. Start out with smaller amounts of water and add gradually. When I bake breads and scones etc. I find that if there is a high amount of humidity in the air I use less liquid, and if it is very dry in the house I end up using more. I learned this the hard way and ruined many a batch by adding what the recipe called for. Thanks, Elena. Totally my fault. I used Einkorn flour from a different paximadia recipe I’d tried last year during tomato season instead of whole wheat, though I didn’t remember I was combining the recipes when I posted. Just made another dough EXACTLY according to your recipe, and the texture is absolutely as you describe. I ended up needing 2 full cups of water. Thanks! I am pretty adventurous, but have to admit these look a little odd and intimidating to me, since I have never had them. Someone on Amazon who reviewed them, gave them a 5 star review but added they are like “human dog biscuits” lol. It sounds so strange to me, to buy a biscuit that I have to “soak” in order to eat them. Any other advice for people totally intrigued but unfamiliar with these? The texture and flavor of the rusks when drizzled with olive oil and topped with tomatoes and cheese is, I assure you is nothing like what the reviewer mentions, it is a perfect combination of crunchy and soft. I have also given several recommendations on how these are consumed in the post. Yes they are sometimes found in ethnic stores and online, unfortunately they are extremely expensive outside of Greece: on amazon they cost $16.95 in Greece the cost about $4. On the island of Crete, these rusks are a staple. 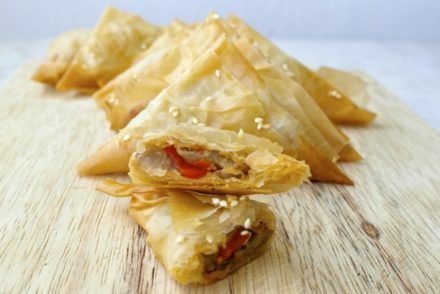 They are hearty and rich in protein and taste delicious with olive oil, tomatoes, and the island’s feta-like cheese. It’s not the same unless you take the extra step to completely dry the slices out! I would like to make barley rusk but I live by myself and am worried that I would have to throw away half the loaf (unless I eat it all in 3 days). How long do the rusk keep for? Hi Claire, These rusks last at least for a month. Keep them in a dark, dry place. Hi Elena, can these be made with only barley flour (without wheat)? If so, does the recipe require other modifications? Thanks so much! Hi Dawn, If you are using only barley flour I would add a bit more yeast (maybe 1 ounce instead of 0.8) and you will need to knead it longer. Also it will have a rougher texture. I’m going to try and make these but before I do I wanted to ask you if 100% stone ground whole wheat flour will work since it’s not whole grain wheat flour? My wife and I have just started adjusting our lives to the Mediterranean lifestyle. I just received my first Barley Rusks from Amazon. How or what is the best way to store them as it will take us a while to eat them all? Any advice would be appreciated. Your blog has been my “go to” for our education and lifestyle change. They last quite a long time. Just keep them in their bag in a dark, dry space. Hello. I am new to the Mediterranean Diet and plan to slowly shift my family towards it. I’ve got a daughter with allergies including wheat and barley (and dairy amongst others) and an extreme picky eater 7yo son who goes for crunchy textures. So….which GF flours would you suggest to make these rusks? Since these are crunchy, I think they would be a great option for us if I can figure out how to make them gluten-free. Also – I’m getting ready to start trying coconut milk yogurt recipes. Would coconut milk yogurt be a good option to replace the dairy yogurt and cheese? I know it’s not “real” Mediterranean food. So The first time i made these with just barley flour, I didn’t add more yeast and, while my son lived them before the second bake, once dried they were too hard. They also didn’t rise enough. This time I mixed the flours including an ost flour… I made sure the yeast had proofed, and let the dough rise longer. The dough doubled, and the second rise also doubled. I am hopeful as I am sure these are delicious. While I live trying to mske these, I also ordered some from Parthenon Foods out of Chicago for anyone in the states who is without a Greek market like myself. I would love to make these! I have a question … I can eat any kind of cooked tomatoes, but fresh tomatoes are a no-go for me. I have tried and tried and tried … I just can’t get them down. So if I wanted to eat these with olive oil and feta, like you suggested, is there something I could substitute for the tomatoes? Hi Ginger, You can add several other vegetables such as peppers, cucumbers, leafy greens (I like arugula), also olive and capers. Yes, that is right. If it is too sticky you can add more flour. I have been reading about the Greek rusks on your site and bought rusks from a Greek company in Australia. On receiving them, I noticed they were made with wheat flour, thiamine, water, yeast, salt sugar, extra v virgin olive oil, bread improver and vitamin E oil (order of ingredients listed on the pack). Are these still ok (healthy) to eat? Hi Mary, What you want in a rusk is to make sure there is either whole grain flour and/or barley flour. I found them finally Elena … I had to drive a long way on the weekend to get them. Now that I have eaten them I will definitely be using the recipe to make them. I’ve just got to be patient and wait for my barley flour to arrive in the post. Thanks so much for the recipe. After this, the next thing I will tackle will be the pita bread … every one I have checked is full of preservatives! Wonderful Mary! Glad you found them! Elena, what is the best way to moisten them? Should I mist them with water or brush it on? Or just top with a watery topping? I bought some at a Greek place near us and am not sure just how to prepare them. Hi Lois, I pass them quickly under running water and then I brush or spray a bit of olive oil on them. I may also sprinkle some dry herbs. Than you can top them with tomato and cheese. After a few minutes the should break easily and fall apart when you bite them, they should be soggy or mushy, but should still be crunchy. I plan on making these myself soon, but in the meantime I just ordered some from Titan Foods and I’m excited to try them! I also ordered Greek coffee, figs, EVOO, and Macedonian tahini with honey. Looks delicious! Do you know if these could be made with sourdough starter instead of the dry yeast? If so, how much would you use? I finally made these today. They turned out great. To tell you the truth I wasn’t expecting to like them with barley flour. I am glad I tried the recipe. It’s a keeper. It’s an easy recipe too. I only needed a total 1.5 C of water. I left 1/4 of the slices out while the rest slow cooked the 2nd time. both ways are good. Thank you for the recipe.